Happy Friday! Today we are sharing a beautiful lake themed card by Larissa! 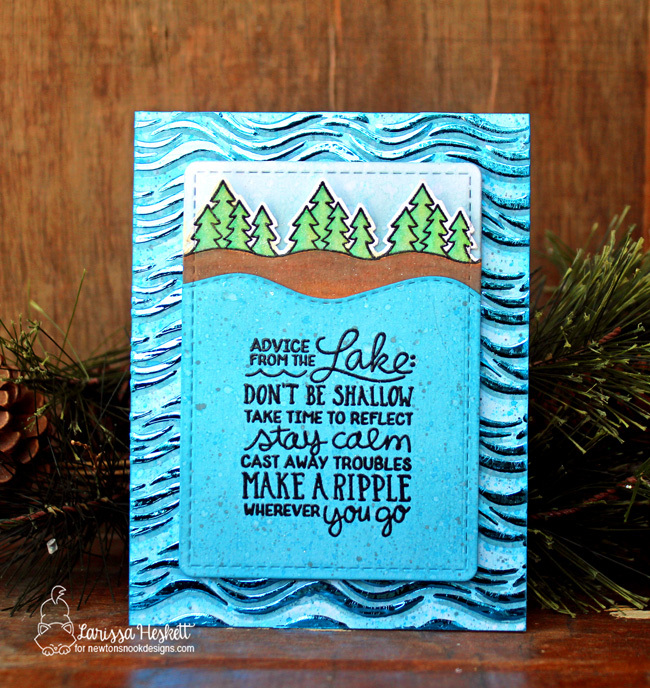 She created such a lovely little lake scene to hold the big fun sentiment from the Lake Advice Stamp Set. She cut out the stitched rectangle panel using our Frames & Flags Die Set and watercolored it with Distress Oxide inks behind the sentiment. She added the wavy lake edge using our Sea Borders Die Set. She stamped the little trees to create a shore line, also from the Lake Advice Stamp Set. For the shiny wave background she used Distress Oxide Inks to create the blue colored background. Then she used Deco Foil Transfer Gel over our Waves Stencil, let it dry and foiled it with the sparkly blue foil! So cool! The sentiment on this set is so inspiring! Larissa is going to link up her card to the 2018 Stamping for Autism Awareness Blog hop too! You can still hop along with this awesome hop for a chance to win tons of amazing prizes through Sunday! Make sure to check it out! Love all the texture on the waves in the background and what a great saying with sweet fonts.